Thank you to our 2018 Sponsors for supporting the Sonoma County Fair. With a per capita income well above the state average and a highly diverse population, Sonoma County is a key market—and the Fair provides a unique opportunity to reach these consumers, plus those from neighboring Marin, Napa, Lake and Mendocino counties. Why is the Fair such a major event? Sonoma County Fair is everything county fairs used to be—and much more. The Hall of Flowers is stunning and is the largest themed floral show in the western United States. Wine Country Racing, with our turf and dirt tracks, is among the most popular thoroughbred horse racing meets in California. With more than 60 rides throughout two carnival lots, headlining entertainment, the region’s premier livestock exhibit, and award-winning special events, the Sonoma County Fair captures the attention of the entire market. Sonoma County Fair offers an extremely efficient cost per thousand and an uncluttered atmosphere. On-site signage, product sampling, inclusion on our heavily-trafficked website, inclusion in the daily schedule of events, messages on our electronic billboard visible from Hwy. 12, and the goodwill associated with the largest event in Sonoma County are just a few of the benefits of Fair sponsorship. All sponsorships are tailored to fit individual needs. Sponsors may choose to target specific segments of the Fair’s vast audience--such as families with young children, teens, or seniors--by focusing on one of the Fair’s many special areas or days. Category Exclusivity: Capture the visitors' undivided attention. On-Site Signage: at your sponsored venue and/or event. 11 Days of Targeted Sampling & Display (additional fee may be required): Outdoor exhibit space can be arranged for your company to display and sell products, sample, distribute literature, conduct consumer research, solicit product feedback and build your database. Web Site (sonomacountyfair.com): Hot link, logo identification, and information about your sponsored attraction at the Sonoma County Fair's official web site sonomacountyfair.com. Electronic Billboard: Identification of sponsorship, shows and times throughout each day of the Fair. Billboard is visible from Highway 12 (east). 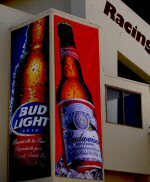 JumboTron: inclusion of sponsor logo and commercials on big screen facing racing grandstand during the race day. Fair Guide: sponsor recognition ad space in the Fair Guide, direct mailed to more than 180,000 households in Sonoma County and surrounding counties. Daily Schedule: inclusion of sponsor logo in each day's schedule. 9,000 are printed each day and distributed on-grounds. Racing Program: advertising space in the Racing Program (45,000), distributed both on-grounds and at simulcast racing facilities around northern California. General Publicity: Enjoy inclusion in on-grounds public address announcements. Right of First Refusal: Be first in line for same sponsorship at the 2019 Sonoma County Fair. A Note on Advertising: A limited amount of advertising space is available for purchase in the Fair Guide, and Racing Program, but not in the Daily Schedule. Only sponsors may have logos in the Daily Schedule. Contact our office at (707) 545-4200 to inquire about advertising.